The Rangers did have their nine game home win streak snapped against the Canadiens on Wednesday, but they still have been superb at MSG, posting a 10-3-1 record. They have not lost three consecutive games in regulation since very early last season, a stretch from October 11 to the 14, so they’ll aim to end their mini slide today. The last time these two teams played, it was a real action packed thriller. The Flyers bombarded Henrik Lundqvist with 48 shots on goal, while the Rangers responded with 39 shots of their own. 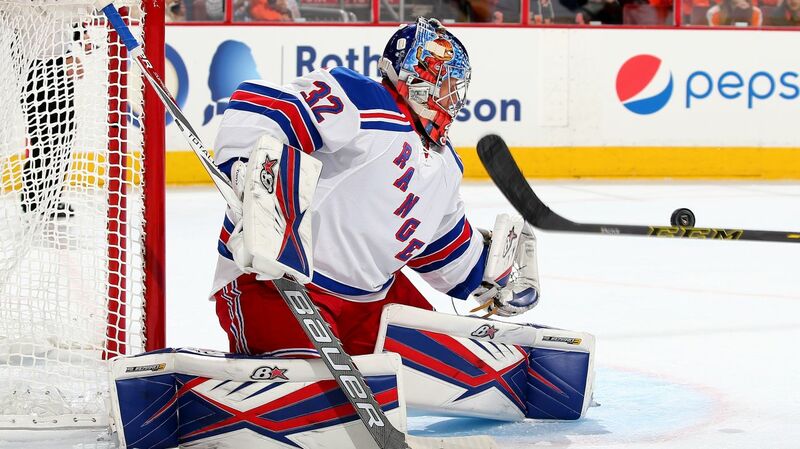 Lundqvist was outstanding, turning aside 46 shots, but New York fell in the shootout, 3-2. JT Miller and Derick Brassard had the two Ranger goals. The Flyers have not been that good this season, winning just four of their last 16 games. On top of that, their top performers and offensive contributors haven’t been contributing as much. Claude Giroux has been good, tallying eight goals and 11 assists. But on the other hand, his partner in crime, Jakub Voracek has a single goal and 12 assists through 23 games. Following a 22 goal, 81 point season last year, that’s disappointing. Wayne Simmonds has just three goals and six assists to start the year. Philadelphia’s goaltending situation has turned into a bit of a platoon job now. Steve Mason was in net for the win over the Rangers earlier in the year, but Michal Neuvirth has outperformed expectations. Neuvirth played in the Flyers 3-2 win yesterday, so Mason will start again. Antti Raanta will get the start in net for the Rangers, making his fifth start of the season and his first since November 15th. Henrik Lundqvist has been off a bit lately, so a day of rest could do him some real good. Also, Raanta has been fantastic on home ice in his career, and he’s won all three starts at MSG this year. Raanta will look for a perfect 5-0-0 start this afternoon. Derek Stepan’s absence, just the second time in his career he is missing regular season. This injury could last upwards of a month, and with him playing 17 minutes a night in all on-ice situations, they won’t be easy skates to fill. Kevin Hayes will have a much larger role for the next few weeks, as he is the most likely candidate to take the second line center role. Hayes has bounced between center and wing, and played all of last season on the wing with a lot of success. He’s crafty, he can hold onto the puck and make plays out of nothing. He’ll be tasked with trying to get Chris Kreider scoring, and to help get more production from that line. Emerson Etem will also become a regular, everyday player from now until Stepan is back. Etem has showed some promise and has played well, but still hasn’t scored. This is a 60 goal scorer in junior hockey who is yet to translate his skill to the NHL. There hasn’t been a lot of production from the right wingers (except Zuccarello) and it would really help the Rangers if Etem can step up and fill that much needed scoring role. He’ll get that chance. There is no confirmed lineup for the game today, but McIlrath should stay in the lineup. Even if Boyle “has” to come back in, sit someone else who isn’t playing well. McIlrath deserves to be rewarded for sticking up for Stepan, and his teammates appreciated it. Also, last time the Rangers played the Flyers, Radko Gudas concussed Viktor Stalberg. So keep him in there. The Rangers and the Flyers will face off at Madison Square Garden at 1:30 PM. The game will be broadcasted on MSG Network. Posted on November 28, 2015, in Game Previews and tagged Alain Vigneault, Beleskey hit, Beleskey hit on stepan, Boston Bruins, Brad Marchand, Chris Kreider, Claude Giroux, Dan Boyle, Dan Girardi, Derek Stepan, Derick Brassard, Dominic Moore, Dylan McIlrath, Emerson Etem, Jarret Stoll, Jesper Fast, Jimmy Hayes, JT Miller, Keith Yandle, Kevin Hayes, Kevin Klein, Marc Staal, Mats Zuccarello, Montreal Canadiens, MSG, New York Rangers, New York Rangers blog, NHL, NYR, Oscar Lindberg, Philadelphia Flyers, Rangers, Rangers blog, Rangers Bruins, Rangers Flyers, Rick Nash, Ryan McDonagh, Stepan broken ribs, Stepan injury, Stepan ribs, Tuuka Rask, Viktor Stalberg, Voracek. Bookmark the permalink. Leave a comment.